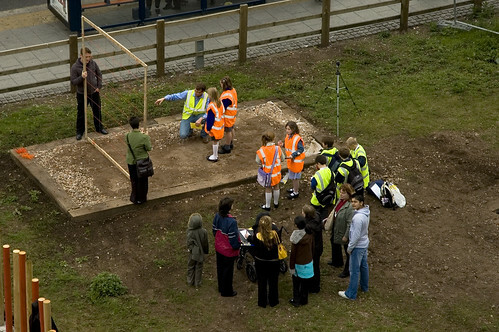 The View Finder is the latest project to appear at the Festival of Xtreme Building site on Moor St Queensway. The View Finder is the result of a collaborative process between an architect Will Schofield of Glenn Howells, five schools and the community of Sheldon. Visitors who seek to enter the inside will discover that the walls are precisely pierced to provide selected views of Birmingham city centre. The views that are afforded through the solid have been chosen by children from Sheldon and are the result of collaborative work with Sheldon Heath Community arts college, Mapledene primary school, Stanville primary School. Brays school and James Brindley school. I saw the collaboration in progress when I visited the site last month where groups of kids were picking out their views. One interesting side effect of this is you’ll see Birmingham from the perspective of a 4ft high person. The launch is this Saturday at 1pm when Clive Scott’s Muvuca Samba Band will be performing. That link has tunes! Also worth noting that the FXB website has been updated and is now written in English rather than the unfortunate funding-speak it was blighted with before, thus more accurately reflecting the style and manner of its envisioner Dave Pollard (but with less swearing). Also, they’re always looking for volunteers. This pretty much involves hanging around the site talking to the public about the exhibits, amongst other things.